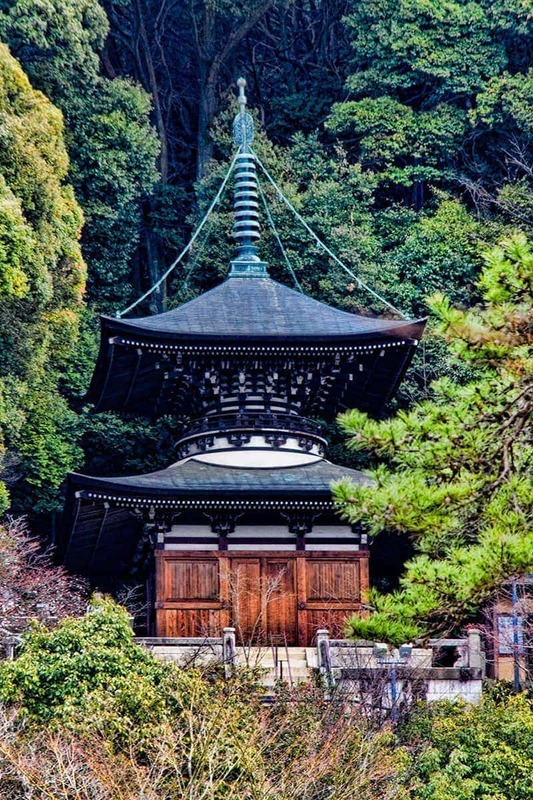 Eikan-do is one of those temples that we wandering into off of the Philosophers Path without any intent or prior conception of what to expect. That can be a blessing and a curse. It’s nice to experience everything with completely fresh eyes and no expectations but also without being able to read or converse well in Japanese much of the history and detail was only filled in later and then I wanted to go back and revisit certain parts. Eikan-do is a temple that is definitely at its best in fall when it arguably has some of the best koyo colors in all of Kyoto. Our visit was in April and it was still very interesting in spring despite the still bare foliage. This is definitely an attractive and interesting temple to wander through it you have a bit of time available while in Kyoto. 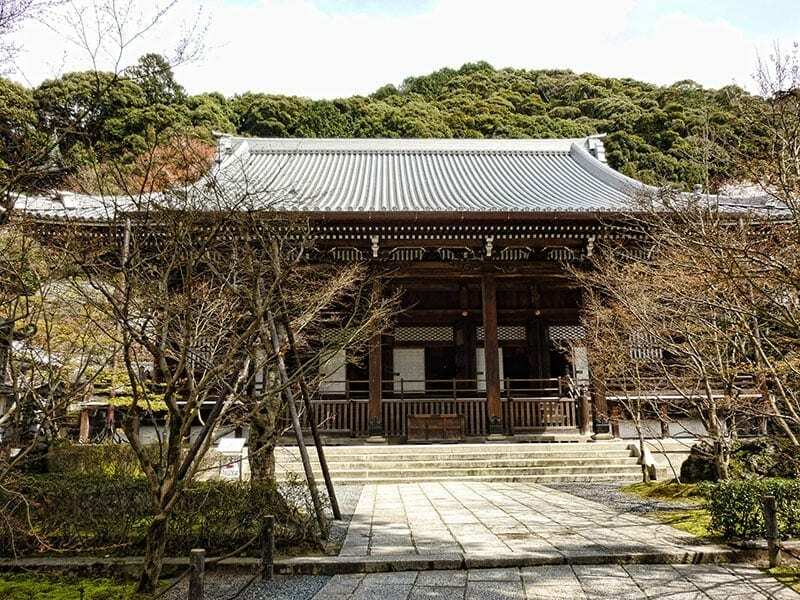 The temples history dates back to the early Heian period (835 AD) when a disciple of Kobo Daishi Kukai named Shinjo built a training hall on the site for the practice of Shingon Buddhism. 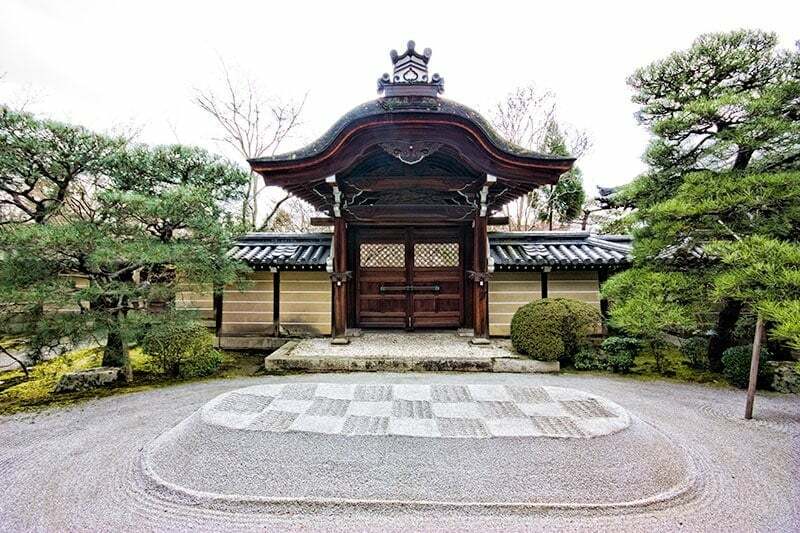 Ten years later Emperor Seiwa gave permission for him to establish a temple there and it was given the name Zenrin-ji. Some still refer to the temple by this name today. Late in the Heian period the Abbot Yokan, known by the familiar name ‘Eikan’ became head priest and he expanded the temple significantly. He was very dedicated to the sick and the poor, he planted a plum grove to give fruit to the sick and built a hospital on the site. He was also known for intoning the Nembutsu as many as 60,000 times in a day. This practice brought Buddhism to the people, it was a practice that was easily understood by the population rather than the complex texts followed until that time that were really only read and understood by the aristocracy. 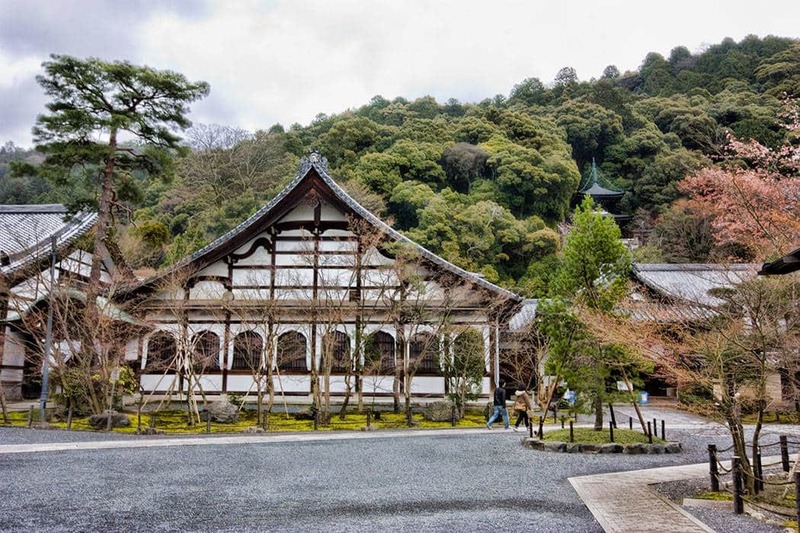 Eikan became so respected and loved that the temple came to be called Eikan-do. Subsequent Abbots including Johen in the Kamakura period and later Shoku studied the works of Honen and Eikan and too became convinced by the strict practice of Nembutsu. Over time the temple converted officially to the Jodo sect teachings. This is the temples most recognisable building and it is quite unique. The two-story pagoda has a square lower story which is quite simple in design while the upper level is round and very ornate. The Taho-to pagoda enshrines Shaka Nyorai (Shakyamuni or the historical Buddha) and Taho Nyorai (the Buddha who represents all past Buddhas and bears witness to Shaka Nyorai’s teachings in the Lotus Sutra). While best admired from a distance being set so beautifully into the trees and hillside, it’s worth climbing up to the pagoda level for the great views back over Kyoto city. The view would be especially pretty during autumn with all the coloured leaves. This hall was moved to the present site all the way from Osaka in 1607! Like any temple it’s not appropriate to take photo’s inside but this hall has several special things to see. The ceilings are highly embellished with hundreds of flowers and of course the hall houses the ‘looking back Buddha’. This Buddha and the story that surrounds it is perhaps the most famous aspect of Eikan-do. It is said that in the early morning of 15 February 1082, Abbot Eikan was practicing walking meditation around a statue of Amida. Now February is really cold in Kyoto, especially in a drafty temple before dawn but Eikan suddenly became aware that Amida had got down from his pedestal and was looking back over this shoulder and beckoning to him saying “Eikan! Hurry up”. Eikan understood this to mean he was on the right path. After that a statue in that form was made and this ‘turning back Buddha’ is the main icon of the temple. 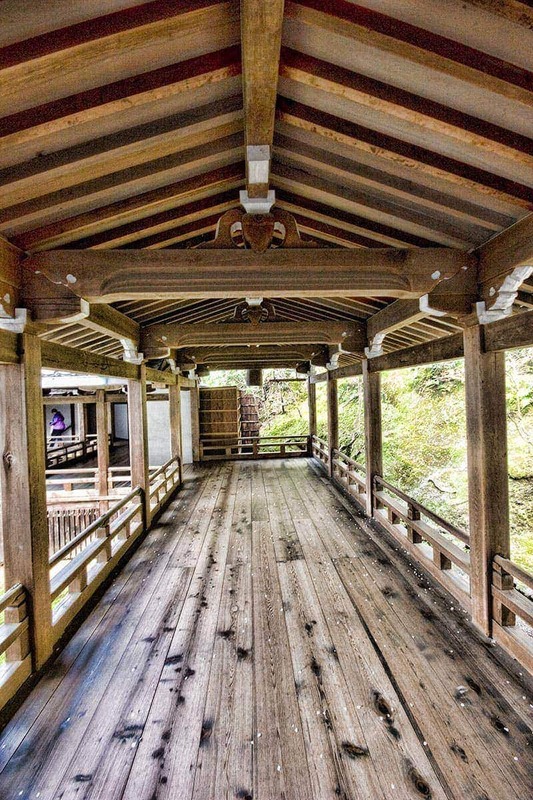 Eikan-do has extensive wooden corridors that run between the various buildings and follows the contours of the hillside behind. It is said that the corridors form the shape of a sleeping dragon and thats where it gets it name from (dragon = garyu). The corridors are made of interlocking wood and you can see in this photo that it’s littered with cherry blossom petals that blew in on the breeze. The open sided corridor isn’t a unique design for temples in Japan but they are unusual and the ones at Eikan-do are extensive, I don’t recall seeing others on a similar design within Kyoto. 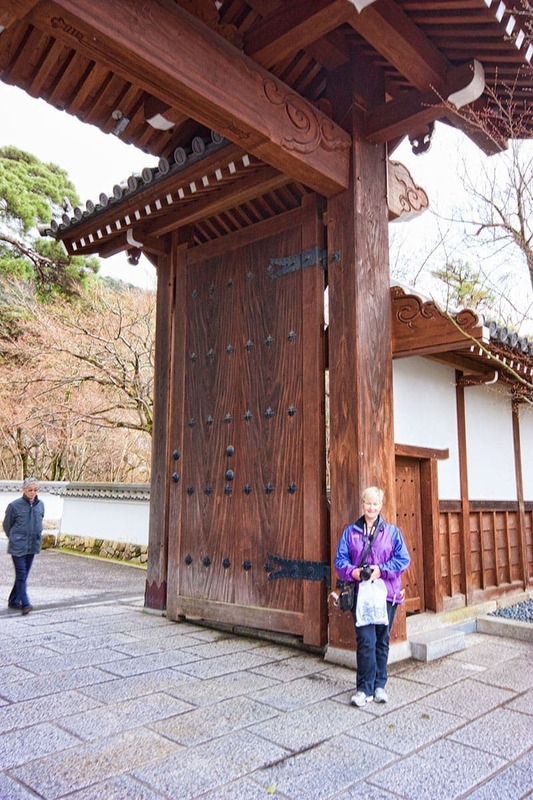 This ornate Chinese style gate is the Karamon gate and was only ever used for the Emperors messengers. The sand garden in front of it is made of course gravel sand raked into patterns with the raised oval directly in front of the gate featuring a checkerboard pattern. At Honen Temple we were told that walking through the entry gate between two of these ovals purified visitors to the shrine, perhaps the messenger walking around (or over) the sand garden did the same thing? We weren’t able to find anyone who could explain the positioning of this one to us. The Somon gate simply means the main gate to the temple. Like many entry gates in Japan the scale is huge and I felt quite dwarfed by it. A suikinkutsu is a cross between a garden ornament and a musical instrument. As water is dripped through a hole in the top it makes a sound similar to bells. 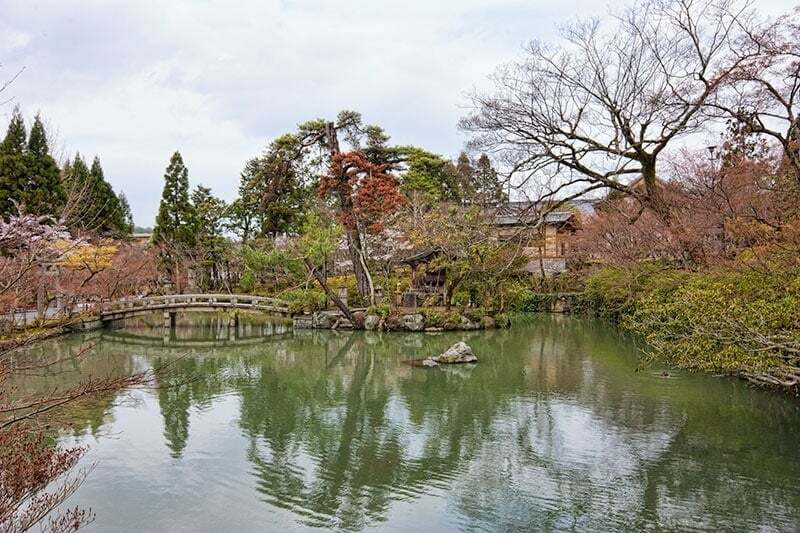 The Hojo pond is fed from small streams around the temple grounds. It’s filled with koi and has a small shrine in the middle with a statue of . I can only imagine how stunning this would be with all the autumn colours around it. I wasn’t able to establish more than the name of this building. The use of the suffix -do indicates it is a temple in it’s own right but I couldn’t establish any more than. I though it was particularly special built into the side of the mountain like that so decided to include it anyway in the hope that someone could fill in further information for me. 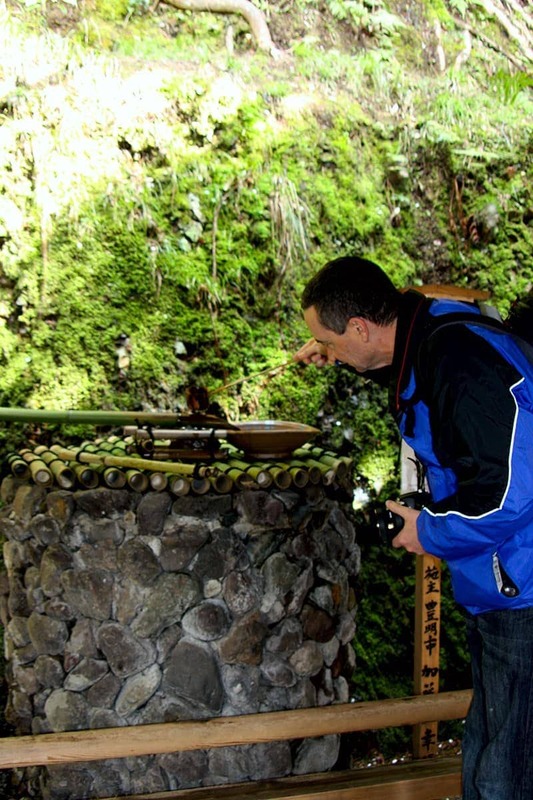 Many people visit Eikan-do while walking the Philosophers Path just before arriving at Nanzen-ji. 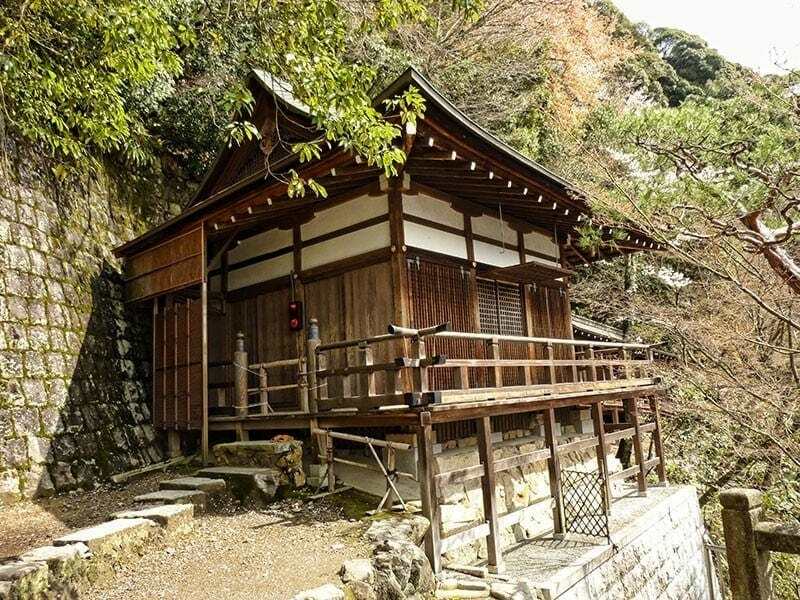 Alternatively you could take the number 5 or 57 bus from Kyoto station to the Nanzen-ji Eikando-michi stop and it’s only a 2-3 minute walk from there. If you prefer the tourist raku bus (number 100) you’ll get off at the Higashi-Tenno stop instead and it’s a 5 minute walk from there. Eikan-do is open 9am until 4pm and entry is Y600 (or Y1000 during the special autumn opening). There are also night illuminations in the second half of November when the leaves are at their most colourful. There’s a gift shop on site and the toilet facilities located near there are western style, some others on the grounds are the traditional type. This map provided by Eikan-do temple shows the layout of the grounds in English. As this is a religious facility there are a few things that are expected of visitors. These include wearing suitable clothing, not eating or drinking in the grounds and only taking photos outside, not inside the temples buildings or of the artifacts including statues and paintings. Eikan-do is a beautiful temple to visit in Kyoto particularly if you’re in the city during the autumn leaves time. Please share you’re experiences at Eikan-do or around Kyoto in the comments below. Great blog! By the way from what I know “ihai” are the memorial tablets to the dead so the Ihai-do must be a hall for keeping them. Oh of course, that makes sense. Thanks Dariel. Ugh! So beautiful. Japan has been in the top 5 of countries to visit next – I always manage to just be passing through on long layovers. MUST make time for a visit – gorgeous photos! Ah, Kyoto was my favourite city in Japan! So much history and beautiful shrines everywhere. Didn’t make it to this one but looks like it would be worth the visit. Thanks Peter. We were told when we were there the first time that there are over 1600 temples in Kyoto alone. We don’t have a hope of getting to them all but we add a few extras on each visit and keep coming up with new favourites. I am fascination by Japanese temples. I can’t wait to visit Japan and have a look. I enjoyed reading the story of the turning back Buddha. I hope to make it to Japan one day soon, its architecture is so fascinating. What a lovely place! I haven’t been to this particular temple but I love Japanese temples and shrines! So, so pretty. Japan really is a special place. A friend of mine is going to Japan on her honeymoon. I am sharing all your posts with her – they are great! How exciting Fiona – do you know what season you want to visit in this time?